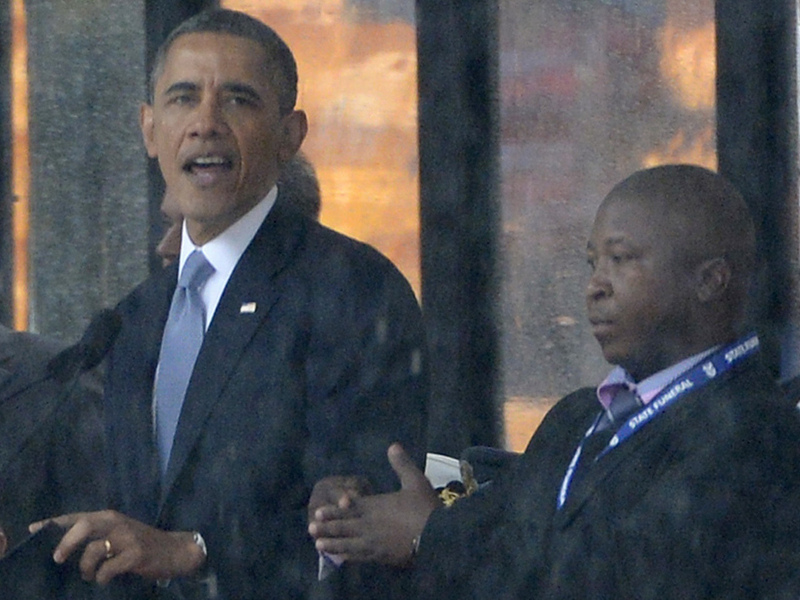 'Fake' Sign Language Interpreter Marred Mandela Memorial : The Two-Way As a man stood next to President Obama and other world leaders at Tuesday's memorial service for Nelson Mandela he only pretended to do sign language, many in the deaf community say. As President Obama and other world leaders spoke Tuesday in Johannesburg at a memorial for Nelson Mandela, a man stood nearby and appeared to be doing sign language interpretation. Many in the deaf community are outraged because the man appeared to be faking. There's outrage among many in the deaf community over the appearance on stage Tuesday of a man who they say was only pretending to do sign language interpretation as President Obama and other world leaders eulogized Nelson Mandela in Johannesburg, South Africa. Among those who noticed what was happening was Wilma Newhoudt, the first deaf person elected to South Africa's parliament and a vice president of the World Federation of the Deaf. "Shame on this male so called interpreter on the stage," she wrote on Twitter during the memorial service. "What is he signing? He knows that the deaf cannot vocally boo him off. Shame on him!" Others who protested included Bruno Peter Druchen, national director at the Deaf Federation of South Africa. "Please get RID of this CLOWN interpreter, please!" he tweeted. The Limping Chicken, a U.K. website that focuses on news involving the deaf community, posted a video showing both the "fake" and a sign language interpreter who many TV viewers saw in a small box superimposed on their screens. The woman in that box was actually interpreting what was said, Limping Chicken reports. You can see how different her actions and gestures are compared to those of the man on stage. According to The Guardian, "members of South Africa's deaf community has [sic] previously raised concerns about the interpreter, who has been used at other African National Congress events." As you can see from the photo we'll attach to the post, the man was within just a few feet of Obama as the president delivered his remarks. IOL, a news site from South Africa's Independent Newspapers, reports that "government spokeswoman Phumla Williams said she was unable to respond to the allegations immediately, as she did not know which department procured the service provider. She said she did not know about his qualifications or expertise." Asked about the apparently bogus interpreter, White House spokesman Josh Earnest said Wednesday that "it's a shame that you had a service that was dedicated to honoring the life and celebrating the legacy of one of the great leaders of the 20th century has gotten distracted by this and a couple of other issues that are far less important than the legacy of Nelson Mandela." The "other issues" he was referring to would include the handshake between Obama and Cuban leader Raul Castro, and the selfie taken by Obama, British Prime Minister David Cameron and Prime Minister Helle Thorning Schmidt of Denmark. Update at 11:20 a.m. ET. Government Is "Looking Into This Matter." "As we look at yesterday's events, government has noted the concern expressed in various quarters about the alleged incorrect use of sign language at the National Memorial Service. "Government is looking into this matter but has not been able to conclude this inquiry due to the demanding schedule of organising events related to the State Funeral. "Government will report publicly on any information it may establish but wishes to assure South Africans that we are clear in defending the rights and dignity of people with disabilities."